Hamza Namira is a singer and songwriter. 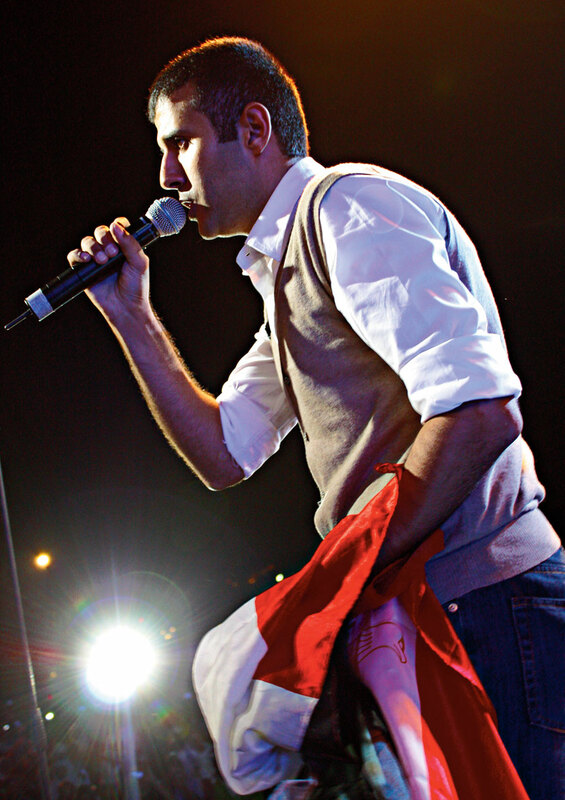 His song Ehlam Maaya (Dream With Me) – written 11 years ago – helped shape the soundtrack of the revolution. What happened in Egypt is much more than a reform movement or a limited group of protests; it’s a revolution with every meaning of the word. I am truly proud to live through such life-changing moments in the history of the great Egyptian people. I went to Tahrir everyday, and I cannot describe my feelings. All I can say is that I could breathe freedom everyday in Tahrir Square. I found the ‘free’ Egypt I was looking for. One day, I found an elderly woman cleaning up the square, and when I asked her why, she said, “Because it’s my country and I love my country.” I discovered how creative and original we are even in times of crisis. From the symbolic gestures like placing garbage on top of police cars and writing “Here lies the NDP” and the sharp yet witty cheers, to the high level of organisation, coordination and correlation. Tahrir was like a free fully integrated city… there was no fear, crime or sexual harassment. And what was really ironic is that when the police disappeared, a lot of the crimes disappeared with them. The real trigger of any revolution is injustice, greed and corruption. And even if the system allowed people means of “artificial” freedom of expression, the revolution remained active and kept growing like a volcano, ready to erupt. I just never imagined it would happen so soon. Social media made it much easier for the revolution to happen, and this is the face of the new world. There is no way to hide the truth any longer. As a singer, I’m gifted with the means to express what people think and feel. But this is not the time for self-glory. Now all I care about is taking part with all my energy as an Egyptian citizen to fight for freedom and help make this revolution a success. My friend, the Egyptian director Amr Salama introduced me to Wael Ghonim after his release. Before then I’d only known of him through his Facebook page, ‘We’re all Khaled Said’ and I admired his deep belief in the right of every human being to live a life of dignity and freedom. So I was really thrilled to find my song Ehlam Maaya (Dream With Me) posted on his page. I later learned that while he was detained, he would recall lyrics from the song every night to give him strength and that filled me with pride. We certainly have a connection on a moral and an intellectual level and I am truly proud of him. Back in 2000 when Sameh Khairy wrote the lyrics for Ehlam Maaya and Ahmed Farahat composed the music, I wondered what this song was destined for. My biggest hope was for a large group of friends to listen to it and believe in the message behind it. And today, 11 years later, a lot of people are calling it the revolution song, and I just can’t express my happiness and pride. Our country was hijacked for 30 years and we liberated it on Friday February 11th. And now we all have a responsibility to work very hard and restore Egypt’s status in the world. I have complete faith that just like we stood together to free Egypt from corruption and injustice, we will stand together now to rebuild what was destroyed over the past 30 years. Soon we’ll see a different Egypt, bright and free; the Egypt that was in Tahrir Square.